How have things changed in digital media in the past 4 years? Why not compare what Coca Cola did for the 2006 Olympics in Turin with what they're doing now for the Olympics in Vancouver? In 2006, the main site was this microsite, which is still live. They took 6 bloggers to Turin, and had them blog about their experiences. Visitors could interteract, but it was really all about what the bloggers thought. Innovative for the time. 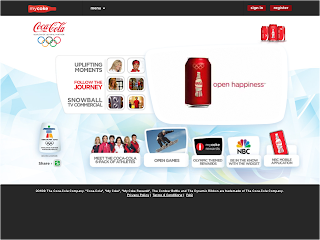 In 2010 they've channelled all global activity into MyCoke - in effect their Olympic coverage has taken over the main site, rather than have a separate location. They then have a special 'Olympic' section within it (ok, a microsite), but it's not specific to Vancouver, so can be reused for an Olympic activity. 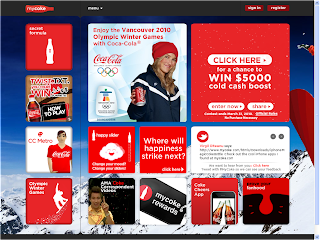 It includes clips, the 'Six Pack' of American athletes (Coke clearly like the number 6), games, Olympic themed Rewards, and, in a tie up with NBC, a widget (here embedded into my blog) and a mobile widget. I think that this shows how much more complex and rich the web has become in the last 4 years. It's more real time, has more video, involves more sponsored content and partnerships, and has a mobile element. But most importantly, it's not a separate initiative. It's a continuation of what they're doing, both in the real world, and in other media.